The Constellation was Omega's first ever mass-produced chronometer. This watch remains a symbol of precision and elegance to this day. Top models are made of platinum and can withstand magnetic fields of up to 15,000 Gauss. Four claws, a golden star, and an integrated bracelet – that's what defines the Omega Constellation. The Biel-based watch manufacturer first introduced this collection in 1952, though the design has changed drastically over the years. For some 30 years, the Constellation had a classic look. Current models, however, have a much sportier feel. The claws at 3 and 9 o'clock resemble small grips and have been the most prominent feature of this timepiece since 1982. Then there's the integrated metal bracelet with horizontal links for guaranteed comfort. The number of models in the Omega Constellation collection is vast. It ranges from 27-mm women's watches in stainless steel to average-sized bicolor watches, all the way to 38-mm gold watches with diamonds. Most watches feature a date display at 3 o'clock. However, there are also day-date variants available, which show the day written out at 12 o'clock and the date at 6. Every model has the same medallion on the case back: the Geneva Observatory surrounded by eight stars. This is meant to represent the accuracy of these watches. The Omega Globemaster is also part of the Constellation collection, though its retro 60s design helps it to stand out from the crowd. A so-called "pie-pan" dial and fluted bezel characterize this series. What's more, the Globemaster was the world's first watch to receive certification as a Master Chronometer, meaning it's not only extremely accurate but also resistant to magnetic fields of up to 15,000 Gauss. Top models come with an annual calendar and are made of Sedna gold, Omega's own rose gold. Limited to a run of 352 pieces, the platinum edition with a blue leather strap is particularly elegant. 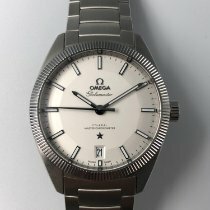 How much does an Omega Constellation cost? The Omega Constellation collection is massive. It covers everything from affordable vintage watches for a few hundred dollars to diamond-studded gold watches for over 58,000 USD. There's truly something for every budget. The design options are just as diverse. Are you looking for a classic dress watch, a sporty yet elegant timepiece with a distinctive design, or a retro watch? Whatever it is, the Constellation collection is sure to have it. If you're interested in the typical Omega Constellation with four claws, your options include watches made of stainless steel or gold as well as bicolor models. 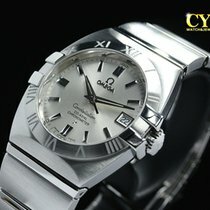 You can purchase a 38-mm stainless steel watch with a Co-Axial caliber for 4,100 USD new. Pre-owned pieces cost around 3,000 USD. Those who enjoy fashion from the 1980s should take a closer look at the bicolor watches in stainless steel and gold. The 38-mm version sits around 6,300 USD new. Buying a pre-owned watch could save you a couple thousand dollars. Mikhail Gorbachev is the proud owner of a Constellation in 18-karat gold. More precisely, his Omega is likely a Constellation Manhattan – a somewhat older and smaller model. The Constellation collection features a few 35-mm men's watches for those who share the former Soviet president's taste in smaller watches. Be sure to set aside around 17,000 USD for a never-worn example. Those in Sedna gold share a similar price point. The collection's top models are made of gold and feature an automatic Co-Axial caliber with a day-date display. Plan to spend about 24,800 USD on the 38-mm version. Pre-owned pieces are much more affordable at around 18,900 USD. There are also editions with diamond-studded bezels for anyone who prefers timepieces with a little sparkle. 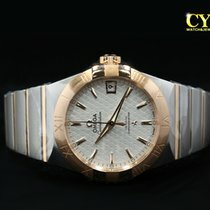 Prices for new watches come in at over 29,000 USD. The Omega Constellation collection also includes numerous women's watches. These are especially finely decorated, often with diamonds. Some examples only use these gemstones for the indices, while others have gold cases that are almost completely encrusted with diamonds from the bracelet to the bezel and mother-of-pearl dial. The official list price for one of these treasures comes in at 130,000 USD for the quartz model and 155,000 USD for the version with a Co-Axial caliber. The simple, 31-mm stainless steel variant with a Co-Axial caliber is significantly more affordable. You can get a new model for around 4,100 USD and a pre-owned one for about 3,500 USD. Editions with a mother-of-pearl dial, diamond indices, and diamonds on the bezel cost 8,100 USD in mint condition. You'll need around 15,400 USD for a Sedna gold watch with a mother-of-pearl dial. The design of the retro Globemaster makes it a bit of a black sheep in the Constellation family. In particular, its pie-pan dial and fluted bezel pay homage to the Constellation watches from the 60s. However, at 39-mm, current Globemasters have kept up with modern trends and are pleasant to wear. What makes this line truly special is how every watch comes with Master Chronometer certification, meaning they can withstand magnetic fields of up to 15,000 Gauss . You can buy examples in stainless steel on a leather strap for around 5,200 USD new and pre-owned watches for a few hundred less. Those with a stainless steel bracelet cost only slightly more. The Globemaster is also available in several bicolor variants as well as in 18-karat gold. A mint-condition Sedna gold timepiece demands a solid 14,600 USD. 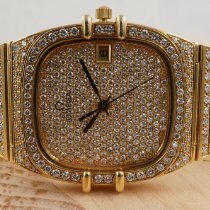 Prices for pre-owned gold watches sit around 12,600 USD. Bicolor editions with a bracelet in steel and gold cost about 8,000 USD new and 7,300 USD pre-owned. Limited to a run of 352 pieces, the platinum Globemaster is one of the series' most expensive watches. Mint-condition timepieces sell for around 30,700 USD, which is about 11,600 USD below the official list price. If you'd like to call a platinum watch with an annual calendar your own, there is also a Globemaster for you. It has an official list price of 53,000 USD. Unsurprisingly, the stainless steel versions are much less expensive. Set aside around 6,400 USD for a mint-condition timepiece and 6,000 USD for a pre-owned one. Unlike the Globemaster with three hands and a date display, variants with an annual calendar are 41 mm in diameter. Omega first introduced the Constellation in 1952 and still produces it to this day. Since then, the design has undergone many changes. It had developed from an elegant dress watch into a modern, sporty watch by the early 1980s. The most long-lasting change came in 1982 when Omega started producing the Constellation Manhattan. Four claws were added on the fixed bezel, two on each side at 3 and 9 o'clock, and they became the distinguishing feature of the Constellation collection. These claws are purely ornamental; jewelers usually use them to border gemstones. Another characteristic detail of this collection is the five-pointed star on the dial over 6 o'clock. It has been featured there since 1952 as a symbol of the watch's tested chronometer quality and prestige, as the Constellation is the first wristwatch chronometer Omega produced in a series. The Omega Constellation is a nod to the field of astronomy as its name refers to a group of stars which form a particular shape in the sky. Over its 160-year history, Omega has participated in many observatory trials, the only manufacturer other than Patek Philippe to participate every year. Omega has been setting precision records since the very beginning. The Constellation collection pays homage to these observatory trials. The star on the dial and the observatory cupola on the case back symbolize Omega's achievements. The Omega Constellation is a very recognizable watch. Since the introduction of the Constellation Manhattan in 1982, the timepieces have featured four characteristic claws on the bezel. Just as iconic are the Roman numerals on the majority of the bezels. Due to the claws, III and IX are left out. Cases come in a few different sizes: There are 24-mm, 27-mm, 31-mm, 35-mm, and 38-mm versions. The smaller sizes were designed with women in mind. Omega offers these watches with automatic calibers as well as electronic quartz calibers. A special feature of the automatic calibers is the Co-Axial escapement, which is an alternative to the usual Swiss anchor escapement. It is much more efficient and its components last longer. Omega offers the Constellation in stainless steel or yellow, white, or red gold. Bicolor models are also available. Stainless steel, gold, and bicolor bracelets are more common, but some models feature leather straps. Models with diamond-encrusted dials are particularly eye-catching. Many of the women's watches use diamonds for indices and bezel decoration. The designers really let their creativity flow with the dials: silver, black, white, brown, champagne, and more – there's a color for nearly every preference. Mother-of-pearl dials give some models a unique look with their shimmering, almost magical effect. The current Globemaster models make up their own line within the Constellation collection. The watches in this vintage-inspired line pay homage to the first models from the 1950s with their "pie-pan" dials. The 39-mm case with a fluted bezel was inspired by models from the 1960s. Together with the Swiss Federal Office of Metrology (METAS), Omega developed a new, practical testing process. The tests assess precision, water resistance, the power reserve, and resistance to magnetic fields. The Globemaster was the first watch in the world to have passed all of these tests, and therefore the first to earn the title of " Master Chronometer." The Globemaster's name comes from the models of the same name from the 1950s. The models were renamed "Globemaster" for the American market, as the name "Constellation" was already trademarked. If you're a lover of vintage watches, Constellation models from the 1950s and 60s could be of particular interest to you. Many of these watches are made of yellow gold and have a slender, gold Milanese strap. Leather straps were also available with these watches. These vintage models can be recognized by their so-called "pie-pan" dials, named for their resemblance to the baking dish. The dials of the first Constellation watches were richly decorated with golden, diamond-shaped indices and tapered, golden hands, as well as the golden inscription and Constellation star. Rounded lugs were another characteristic feature up until the 1960s. 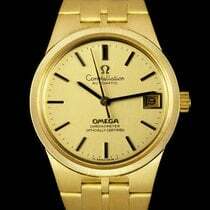 Omega later redesigned them to be more rectangular while maintaining their elegance. The case backs of these watches feature a medallion hand-engraved with an image of the Geneva Observatory. Eight stars above the observatory symbolize the chronometer tests developed with METAS. Omega exclusively uses chronometer-certified movements in their Constellation watches. Caliber 551 (no date) has proven itself to be particularly precise and reliable and has been powering Constellation models since 1959. It's 27.9 mm in diameter and 4.5 mm thick. The balance wheel vibrates at a frequency of 19,800 alternations per hour. A patented mechanism allows the rotor to wind the barrels bidirectionally. Variants powered by this caliber have developed into this Swiss manufacturer's most successful timepieces. In 1963, Omega broke numerous precision records in the wristwatch category with this caliber family. Omega's Constellation collection has always represented precision, and it remains so to this day. Innovative technology such as the Co-Axial escapement improves efficiency as well as precision and reduces friction between the movement's components. This makes lubrication unnecessary, and the watch requires servicing less often. Two barrels in the calibers 8500 and 8501 ensure a power reserve of 60 hours . The 8501 features an 18-karat red gold rotor and balance bridge. The 8500 and 8501 power the 38-mm versions of this series. In the smaller 35-mm versions, Omega uses caliber 2500, the very first Omega movement to feature a Co-Axial escapement. The timepieces are available as simple three-hand models without additional functions, with a date display at 3 o'clock, or with a day/date display. In the day/date versions, the day is written out at the 12 o'clock position and the date is at 6 o'clock. These watches are powered by the calibers 8602 and 8612, both with a Co-Axial escapement. Both the date and day displays spring forward right on time at midnight. The calibers both have a 55-hour power reserve and feature a silicon balance spring. If you're interested in a comparable watch with a day/date display, take a look at the Rolex Day-Date. The Day-Date is available exclusively in gold or platinum.